Includes QR code Previous edition: Boston: Wadsworth Cengage Learning, 2012. 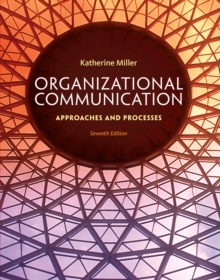 ORGANIZATIONAL COMMUNICATION: APPROACHES AND PROCESSES presents organizational communication from both a communication and managerial perspective. Professor Miller's clear writing style and consistent use of examples and case studies result in a text that you'll find easy to understand.